Expertly crafted with exceptional attention to detail, this Ten Ryu Japanese Katana sword features a massive blade of 1045 carbon steel that has been hand forged using an artisan clay tempering technique. This traditional design offers a heavy blood groove spanning the massive blade and a hand-sharpened edge that will slice with ninja precision. 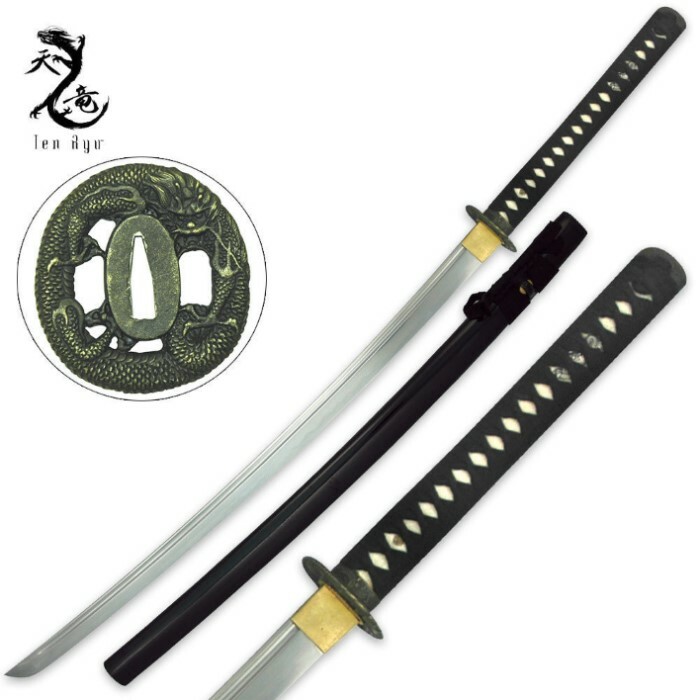 Ornate details such as the cast zinc alloy dragon tsuba, solid brass habaki and genuine ray skin tsuka (handle) make this fully functional collectible Dragon Katana sword a prized showpiece among collectors. The hardwood scabbard has a high-gloss black lacquer finish with coordinating cord accents. 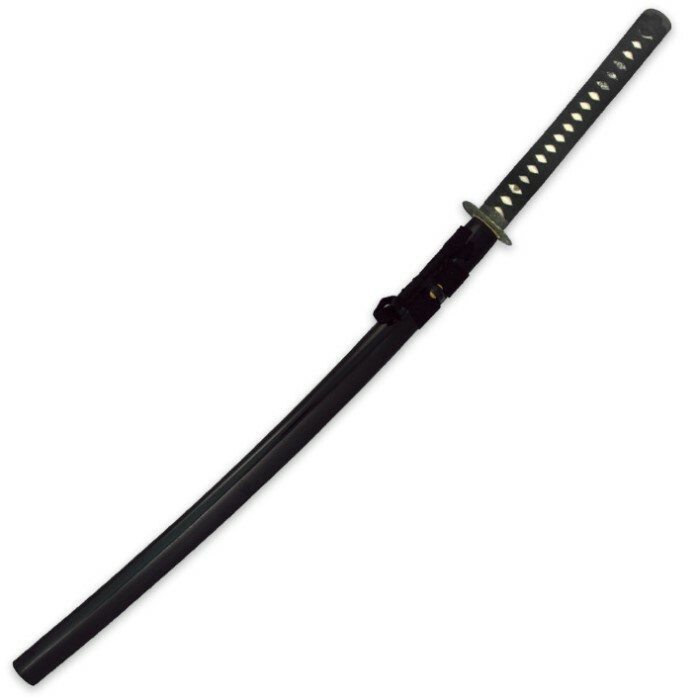 It never ceases to amaze me how such high quality swords can have such a reasonable price. Got this thing yesterday, and once again, True Swords does not disappoint. The blade was nice and sharp, the whole thing was longer than I expected. What really drew me to this sword was the dragon tsuba. Now I think I have more swords than I need, but at the same time, I doubt my swords collection will ever be complete. 5 out of 5. My review of this sword would be identical to the review by Tom from Kentucky if I had not seen his just now. I know it was unrealistic to believe this sword would have had a real Hamon and be clay tempered but I have another Ten Ryu that is superb and trusted the write up because there have been some quality buy from Budk in the past years. Glad Tom wrote the Ten Ryu product code in his review, it's the same one that arrived today and I initially thought they had sent the wrong product. It's a nice enough sword for play and display. This sword came very quickly, and arrived super sharp. For the money I'm sure it will do just fine, however, a couple of caveats: The Fuchi (collar near the guard) on the Ito (hilt) is a little bit loose, nothing to write home about, but it rattles a tiny bit, and the tsuba (guard) is small and thin. Most importantly, I do not believe the blade is deferentially hardened (ie clay tempered) as the description indicates. There is a Hamon (temper line) but it is clearly faux and not the natural line that occurs when tempered in the traditional manner. For display and backyard cutting of bottles this likely will not matter, but if you are paying for a sword thinking you'll get the more desirable clay temper, you likely will be disappointed. (The ten ryu product code is JL808, and other sellers do not advertise it as clay tempered that I can find) Overall, I believe this will be a fine blade, with full tang, double pegged construction, decent carbon steel, and good balance. It should do its job of destroying water filler plastic bottles just fine.